I am fairly new to collecting/building, but am a tad concerned that this is starting to become an obsession. Judging by the size of some peoples collections and the multitude of posts about sorting and storing etc I am guessing that I am not the only one getting (addicted?) obsessed. Has anyone tips on how to keep your spending under control, or am I alone in this feeling and everyone else has it in check? Just posting this to see peoples thoughts. This may sound bad to say on a forum, but I find that the less I frequent the online LEGO communities the less I spend. I hold nothing against the communities, I love them! Brickset and the rest! However, when I get online it is tempting to get caught in the hype of rare polybags or collectible figs or the newest UCS set. I start to think that I really need this or that. However, its not the case. I've often said that the internet magnifies our passions, whatever they may be focused on. This happens to me when I get online and look at LEGO. I'm trying to keep my LEGO budget responsible, too. A few things that have helped me this year to improve. First, a set monthly budget. Whether $25 or $100 the budget is set out from the beginning of the month and discussed with my wife, thus ensuring accountability. If I want to spend more I have to clear it with her and/or get rid of something I have. Second, I've decided I'm not a collector, I'm a builder. I don't need everything. I can't get everything. So I'm focusing on certain themes and shifting the spending more to Bricklink piece orders. Third, I have a space problem. I simply can't keep things sealed and collecting dust. This keeps me wary of buying too much. Find out what aspect of LEGO applies most to you and focus on it. If it is building try to spend more time at the desk building and less in line at Target. Veedubguy83, very very simular experience. I too only wanted to collect Star Wars themed. Where there is a slight difference is that I think I have spent in the region of £3000!! I have a 4yr old and a 2 month old so I too had convinced myself that they will love them when they get a bit older (the 4yr old loves the small sets already), but in reality that is an obscene amount of money for 'toys'. I suppose I kinda fool myself into thinking they are also 'investments' but in reality if you are spending money you havent got its often gonna cost more money in the long run. Thanks for the Tips Tervlon, think I will set a firm budget each month going forward. Tervlon, very good points and ideas. I completely agree that if it wasn't for the internet, I would probably have save a lot of money. The other very very big issue for me was that I started working as a seasonal employee for TRU back in the fall for extra money, they have since then kept me on part time, so in essence they fuel my LEGO addiction, and that extra money... Well we know where that goes. Spending can definitely go out of control. I tend to find that the most rabid spenders are newcomers to the hobby, coming out of their dark ages. When I entered the online LEGO community back in 1999, I probably spent $50,000 on LEGO within the first 5 years. Luckily, I could afford to back then. But despite having not much of a change in budget, my spending started to drift off, and now I spend a lot less on LEGO every year. 1) When you're still new to the hobby, you're more likely to buy more. It's still got that "new LEGO smell". 2) When you're surrounded by crazy AFOLs buying up MORE than you, you'll want to act similarly, and will likely buy more. 3) Try to remember that luckily for us, there are re-sellers. Back in the early 2000's, people started to catch on that LEGO is valuable on the collector's market, so if there's a set you want from 2000 to present, chances are good you can find a copy. It might be more expensive, but it'll be there waiting for you. 4) Learn which types of sets come out at what pace, and set yourself a budget accordingly. A lot of hobbyists set a budget, buy a ton, and then are totally caught off guard when a big set comes along (like the UCS Millennium Falcon) that they can't afford. So keep some of your budget in reserve for that set that you know you can't live without! 5) Sure, LEGO's an investment, but you can still live just fine without it. The difference between being "complete" and "not complete" is psychological-- try to ignore it (if that's contributing to your buying urges-- it was for me). Try to buy what you want, not what you need to be complete. I've recently made this point elsewhere, that collectors definitely hold tendencies towards obsessive and compulsive behavior. That is OK, as long as one is able to recognize those tendencies and does not let it become a negative life impact. The truth is this is a hobby and it provides entertainment and enjoyment. This is what disposable income is for. It's up to you whether you want to go to the movies, skydive, read a novel, play video games, go gambling, etc... or collect and build Lego. All of these activities require an investment of time and money and prove enjoyable activities to participants. It's up to you to decide where you would rather spend your free time and disposable income. Now, if anyone finds that they are spending beyond their means or that quality of life suffers because of the time spent on Lego, then I would strongly recommend seeking help. That said, I think that despite all the comments of hurting their wallets and spending too much, most people probably have a healthy, only slightly obsessive relationship to the hobby. Overall, the more honest you are to yourself and others about what you enjoy about the hobby, why you do it, and how much you spend on it in terms of time and money, the better off you'll be. I don't currently have a full-time job (I'm in my last year of HS, so my life is a mess), so I find it pretty easy to control my "obsession." In fact, I rarely buy LEGO sets: I just get these random flows of a pound here and there from people for free; I think that's a good thing, because like me and video games, I'm pretty addicted to LEGO, but I don't really get a lot of them. I'd say to really focus on what you want. Establish a budget - tell yourself how many dollars (or usually hundreds of dollars) to spend in a year. Then, when new sets are announced, pick a few sets that you really, really want. Do you really need every Atlantis set in the theme? Unless you love Atlantis like I love Harry Potter, probably not. I also find that when going to buy (online or in stores) head directly to the set, pick it up, and go to the check out. While your money is in your pocket, you're more tempted to buy that $15 Castle set that you might like a little bit but don't really need. Within the last two years I've been more serious on buying and collecting Lego sets than in the past. Back in the early 1990's, I bought and collected sets but nothing like I do now. It's been like a 15-year gap between my early to late interest in Lego sets. I'm a collector not a builder. The last set I opened and built was set 7566 Farmer. I consider this a hobby and I'm obsessed about. I love the hunt....whether it be store sales, online sales, or eBay auctions.....I like the deals. Still, I'm enjoying the feeling of collecting LEGO again - I've missed it. I always maintain that LEGO is a timeless item - even if you grow out of it, these things never become useless. You can break them down and create new things and kids always love it. So in a sense, I'm not just building up my collection, I'm also providing my future kids with awesome stuff to enjoy. One good way to keep the spending under control is to only buy the big sets. That is correct spend more per set = spending less. There is greater satisfaction in building the Shuttle Adventure 10213 vs. the Space Shuttle 3367. I have both. Also, it's a great way to reduce the clutter. The picture below illustrates my point. That photo doesn't include my Star Wars, Sponge Bob, City Airport, and so on and so on. My Cafe Corner and Green Grocer are buried under nonsense. I could have done without the Fuel Truck, Camper, and more. But, because I used my money to fuel my OBSESSION I missed out on so many cool sets. The list to long to mention. Also, really try to stick to one or two lines. Bigger sets = a more satisfying collection. Just my opinion. I think there is something to the coming out of the dark ages argument. I came out after about 20 years last november, and since then I have dropped over 10k..(had to make sure my wife wasnt around to say that :-) ) Now I basically have all the sets I want that are out now and some older sets so I only will have to keep up with new sets as they come out. I dont buy doubles so that helps me as well. Either way we are all obsessed, but we are all happily obsessed! I'm lucky in that my wife doesn't have any issues with me buying as long as we have the extra money. I sell a lot on Ebay so most of that is my "play" money. I don't collect like most people seem to here. There are very few sets that I buy to build as actual sets. I buy mostly for my inventory for MOC building. There are a few exceptions like the mod. buildings and the Medieval Market. I also have a handful of classic sets displayed because it takes me back to when I was a kid. I came out of my last dark age about 8 months ago. I used to have a massive collection so I've been buying heavy on bricklink to try and get back to a point where I have enough to start working on some larger MOCs. Keeping track of expenditures is a great way to keep spending in control. It is the same logic as keeping a food diary when you're on a diet: by seeing the actual amount you spend, especially in comparison to your budget, it helps you keep your spending habits in perspective. The ACM in Beta right now is an awesome tool to help you keep track of how much you're spending. I too am just out of my dark ages but have so far resisted buying too many sets. * Actually I am about to break rule 3 with a speculative purchase of a set that is about to go OOP, that I am not at all keen on so I won't be tempted to open the box, and which I expect to rise in value significantly and I'll sell it within the year to fund another purchase. "Actually I am about to break rule 3 with a speculative purchase of a set that is about to go OOP, that I am not at all keen on so I won't be tempted to open the box, and which I expect to rise in value significantly and I'll sell it within the year to fund another purchase." I think this is one of my problems, I have done the same on a few sets, but if I am honest with myself I dont think I will let them go. I have never had any interest in Trains, however I cant see me letting Emerald Knight go as it is such a lovely set and I know one day I will kick myself for selling it and have to pay double what I got for it. I appreciate everyones thoughts on this, lots of good advice too. Cheers. Now got to find a way to turn down the Taj Mahal for £220. Wish me luck! Everything I spend goes into an excel file, so I can I keep an eye on my spending rate. Also, its important to keep looking at the big scary total figure, and imagine the type of car you could have bought for it. Actually I think I'm going to drop that jpeg in there just to help keep myself under control. But yes, I believe collecting is a form of obsession. So long as youre getting real pleasure out of it rather than just satisfying your greed. In toy story the toy collector guy is portrayed as a strange obsessive with no friends who sees the price he can get for things and never plays with them or seems to derive anything from them which gives him any real pleasure. A reminder of what not to become. I send too much, I don't keep a record as I think it will scare me. Basically if I have the money I will buy it. I too spent a small fortune in the past 14 months...$8500+ USD. I use my three year old as an excuse to buy at the stores. But honestly, my purchases is a lot cheaper than psychiatric treatment:) Kidding aside, sorting my LEGO elements calms my nerves and lowers my blood pressure. ^ I also find sorting to be very calming and relaxing. I usually sort for an hour or 2 before bed to relax. I just updated my list of sets and the total RRP is $2,896. This is probably close to what I paid for them, not including sale's tax. And, if I were able to locate all the sets I want, the cost of satiating my Lego lust would be $1,725 (it would be more but there was not a RRP for the sets that have not been released). I am 32 and I began re-collecting legos in May 2010. It started out at the Downtown Disney Lego Store. I too tried to blame my three-then, four-now year-old. However, I can admit the trough to you and myself: I am a grown man who plays with legos. There is no going back. I figure I don't drink or smoke, and as much as I spend on LEGO, it is less than I would if I did. And the LEGO lasts longer. Building sets, setting up minifigs, and sorting pieces really relaxes me. With a six week old son (future AFOL?) I need all the relaxing I can get! Though spare time is hard to come by these days. (I get more than my wife does though, so I shouldn't complain!) Can't wait for him to get into LEGO though. That is an excellent point. When I feel stressed or have a headache I go build something and bang I'm cured in about a half an hour. But, the best way to keep the expenditures down is to buy 1 20lb lot on ebay with instructions and you will be busy sorting and putting your " new " sets together for at least 2 months. I'm trying a new approach and so far it seems to be bringing my spending under control. First, keep a record of how much you spend on Lego each month. Second, be more picky about the sets you buy and plan based on the sets scheduled to be released (this avoids spending all your money and missing out on something awesome). And third, wait to buy new sets until there is a sale. If they have just come out, they'll be around for a while and unless it is a special set it isn't something that has to be bought right away. Ah, a lego support group! Just what I need. though you guys are making me feel I can justify my spends far too easily. I was feeling guilty about spending £150 on ebay after coming out of the dark ages! I also spent about £200 on new sets too. I'm weighing up buying 2 of things that I think will increase in price later (like the trains), so I can play and sell the other...does this work, or do you just end up with more lego and no room to store it?? ^ Buying extra sets to resell in an effort to offset the cost of the hobby is a viable practice employed by many, including me. Some employ the method you mention -- simply buying a second copy of the sets they desire -- and many claim that it completely offsets the cost. Others scoop up any and all discounted LEGO they can find, since most sets appreciate, but it definitely takes a great amount of diligence. There are a lot of useful tips in the "Buying and Selling" category. @rocao .... thanks, will post reply there. Thanks guys, I guess I wanted reassurance that my logic isn't too flawed. 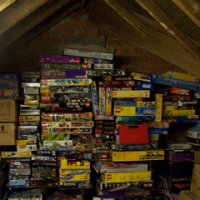 There's a winter toy shop and an advent calender in the loft from John Lewis's post xmas sale. I doubt I'll be able to resist the advent calender next december, but happily I have the toy shop (though at full price :-( ) so I'm pretty happy I can resist opening duplicates. But I've already got 2 cupboards of random lego now! Hubby has said I can get the train if I sell some on ebay. I've got a HP winged room complete, 7016 (http://www.brickset.com/detail/?Set=7016-1) complete, a 6477 with out the minifigs and 7131 with no instructions (and a couple of tiny bits missing - might replace those before selling). Sorry! I went into a selling whine there, completely off topic, please ignore!